Two sisters collaborate on a modern, organic-looking textiles line, Burrow and Hive. Who they are Between Freivogel’s interior-design degree and Gates’s master’s in landscape architecture, the two sisters have a definitive propensity for design. After graduating from their respective programs in spring 2009, the Kansas City natives both started off working in their fields. 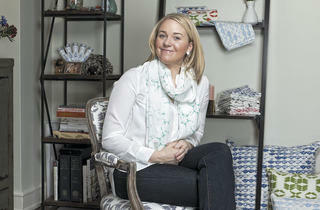 Freivogel did some soul searching and realized her passion for interiors centered around fabric, color and textures. She enrolled in a screenprinting and fabric-design class at the School of the Art Institute of Chicago while Gates decided to take classes in graphic design in Boston. Joining forces and skill sets, the duo landed on the concept of launching a textiles line, and by fall 2010, were in the thick of researching everything from printing houses and seamstresses to fabrics and dyes. Meanwhile, Gates moved to Chicago to get the line off the ground. 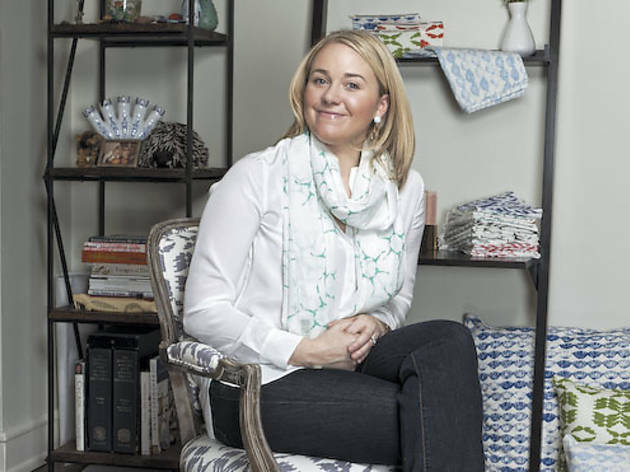 By early fall 2011, Burrow & Hive had its first seasonal collection in hand: cotton and cotton-linen-blend pillows ($80–$95), place mats ($28) and pouches ($18–$25) plus cotton and merino wool scarves ($90–$170). What they make Freivogel attributes their nature-inspired patterns to their childhood, growing up in a family of painters who encouraged the girls to sit outside and make art. For instance, the “quills” resemble seashells, and “wings” took inspiration from bee wings. Since Gates recently moved to Toronto, the sisters spend every morning on Skype going over designs, color swatches and business ins and outs. They both start the prints with hand drawings and pass alterations back and forth until they’re satisfied. For spring/summer, find wave- and palm-frond-inspired designs on the same types of products; in the future, expect a wider range of fabrics for products such as shower curtains and bedding pillows. Where to find them Mecox Gardens (406 N Clark St, 312-836-0571) and burrowandhive.com.